Originally published as a guest post on The Weekly Crisis, on June 9, 2009. Imported here after that site shut down. The very first scene in issue one is a break-in at a Central City crime lab: an unseen assailant kills the CSIs and re-creates the lightning-and-chemical accident that transformed Barry Allen into the Flash. In his internal monologue, he “speaks” as if he knows Barry Allen and even claims to have brought Barry back from the dead — and that it was the worst thing he could have done to him. It’s not likely that Geoff Johns is introducing an entirely new character. So, who might he be? What we know for sure: He’s a man, has white hair, and carries a staff tipped with a lightning-bolt-shaped blade at each end. In short, not much. Also worth noting, Barry has picked up a new, traumatic backstory, which Geoff Johns has hinted is part of a crime committed against the Flash — in short, deliberate manipulation of history. One page of the preview for issue #3 also suggests a time traveler may be involved. There’s been a lot of discussion on various message boards and around the web about the possible candidates and I’m sure everyone’s been wondering just who the mystery villain is. As such, I’ve put together my own list of candidates and reasons why each makes sense. Hit the jump to find out who made my short list of suspects! Today’s guest post is by Kelson Vibber, a fellow blogger who runs several sites dedicated to the Flash, most notably of which is SpeedForce.Org, a blog that follows all things related to the Flash, from previews and reviews to random opinion or editorial pieces. He also runs a fan reference site, Flash: Those Who Ride the Lightning, and you can even follow him on Twitter @SpeedForceOrg. So, he’s got the personal connection to Barry, he’s a time traveler, and he’s a known murderer. On the downside, he already has super-speed, so he wouldn’t need to recreate the accident and, more importantly, he’s also dead. Barry killed him when he attempted to kill Barry’s second fiancee, Fiona Webb. But, then, he is a time traveler…and who better to fight a resurrected hero than a resurrected villain? Worth noting: his first formative tragedy was very similar to the traumatic events inserted into Barry’s history. However, Zoom lost his powers in last year’s Final Crisis: Rogues’ Revenge and is currently confined to a wheelchair. Some people have suggested that the initial POV shots of the mystery villain look like they could be from wheelchair-height and the fact that he’s standing in the splash page is consistent with the fact that his powers enabled him to stand, so there is a distinct possibility it is Zoom. So…time-based powers, a mad-on for Flashes, an obsession with tragedy, and a parallel to Barry’s new background? Sounds good…except that he’s always been focused on Wally West and has shown no other interest in other Flashes or characters until now. Clariss was a scientist who obtained a sample of the formula that gave Jay Garrick his speed. Ridiculed for his theories, he nonetheless developed a speed formula after years of research. Bitter, he used it to become a crime boss as the “Rival Flash.” He vanished into the speed force years before any Flashes really understood it only to find himself in a living hell because his speed was only temporary. 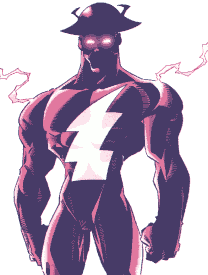 The Rival returned as pure energy decades later, determined to get revenge, and subsequently took possession of Max Mercury’s body, trapping the hero’s soul in the speed force. The Rival was last seen escaping into a time sphere in the final issue of Impulse. Upside: Geoff Johns himself brought Rival back from a 50-year absence (his first appearance was in 1949, and his second was in 2000). And he was last seen in a time machine. Downside: again, like Professor Zoom, he already has super-speed, and wouldn’t need to re-create the accident. Plus, he’s always been focused on Jay Garrick, not Barry Allen. Barry Allen’s identical twin brother, separated at birth and raised by con artists. By the time he learned of his biological family, he had become a career criminal and murderer and Barry had become a cop. Thawne became obsessed with Barry, whose life he could have lived but for a random chance. Where Barry was a man of science, Malcolm learned magic and tried to destroy Barry’s life. 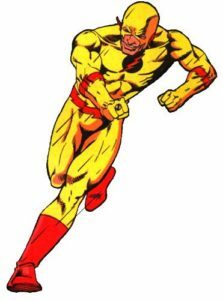 When last seen, his spirit had vacated his body to attack Barry through other speedsters. 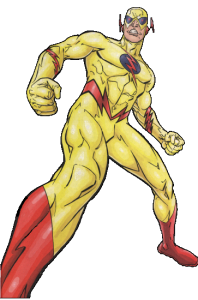 Wally West forced enough speed energy through him to destroy his spirit — or possibly trap it within the Cobalt Blue gem. Like his future descendant, Eobard, Malcolm Thawne is completely obsessed with Barry Allen. He could certainly be interested in becoming more like his brother. And according to several message board posters, the one chemical whose name we see – ninhydrin — produces a characteristic blue stain when used, possibly hinting at Cobalt Blue for the villain. The “Zen Master of Speed” has been a hero since he gained his powers in the early 1800s. Over the last 200 years, he has jumped forward in time repeatedly as he tried to enter the speed force, always skipping off the edge and landing decades later. He came out of retirement the last time Barry Allen “returned,” when he turned out to be an amnesiac Professor Zoom posing as the Flash. He then stayed active to train Bart Allen (Kid Flash). Max’s spirit has been trapped in the speed force since the Rival exchanged places with him, way back during the Crossfire storyline. As far as any of us knows, his body is still possessed. Here’s the thing, though, for all the time that Max has been gone, he’s been mentioned in both issues #1 and #2, and you can actually spot the name MAX in the lightning on the cover for issue #1. And he got his zen nickname by knowing more about the speed force than anyone else. Finally, he’s one of the few characters on the list with white hair. The question is then, why would he turn evil? He could have been corrupted by his time in the speed force, which seems to be a lot less benevolent these days than it used to be. He could be blended with Rival’s personality or he could even be acting according to a bigger picture to restore balance to the speed force with the death of the Black Flash and Barry’s return. Hopefully this short list of suspects will give people some insight into who the mystery villain Geoff Johns has lined up for Rebirth and I suspect we’ll find out who’s been pulling the strings either on the last page of tomorrow’s Flash: Rebirth #3 or, at the latest, in issue four. It is a mystery, after all, and you can’t reveal the villain too early (unless you’re writing a “howdonit” rather than a “whodunit”). But, for a superhero story, you need time for the hero and villain to actually fight — and since this was originally a 5-issue miniseries, the middle of #4 seems about the latest point to place the reveal. This entry was posted in Flash History and tagged Cobalt Blue, Eobard Thawne, Flash: Rebirth, Hunter Zolomon, Imported Post, Max Mercury, Reverse Flash, Rival, Speculation, Zoom on June 9, 2009 by Kelson.